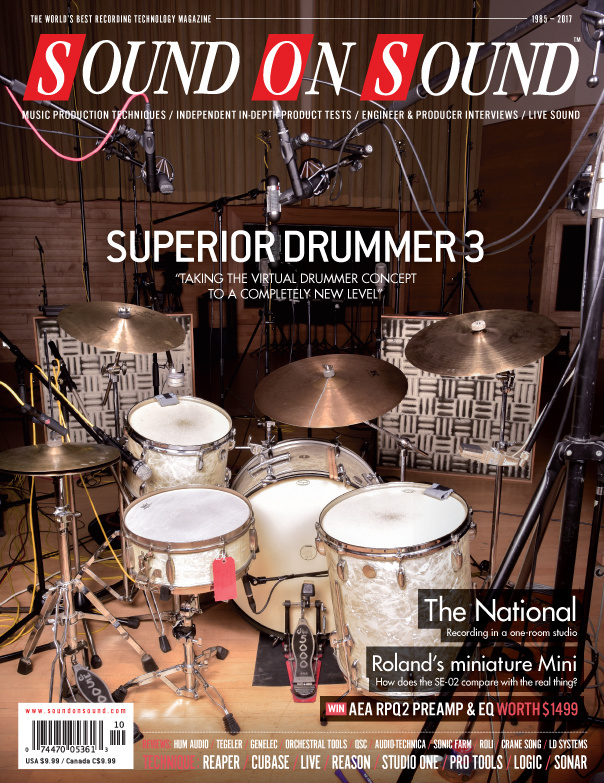 Reviews: Toontrack Superior Drummer 3 (Cover), Roland SE-02, Audio-Technica AT5047, AudioEase Indoor, Roland System 8, ROLI Blocks. Technique: Session Notes, The Sampled Orchestra Part 4, Library Music Part 6, Inside Track: Lana Del Rey, Classic Tracks: DJ Shadow ‘Midnight In A Perfect World’, National: Recording Sleep Well Beast, Mixing New Order live. Mic manufacturers can sometimes seem to be stuck in the past — but not so Audio-Technica, whose innovative capsule technology yields impressive results! With yachts, SUVs and auto garages on the menu, Indoor is not your ordinary reverb. UltraTap delay was an algorithm in Eventide's H9 processor, but it has now become available as a plug-in in its own right. Polish company HUM Audio have set out to make the finest ribbon mic known to humanity. Have they succeeded? If you want a big sound from a small PA, LD’s latest column system might be just the ticket. Leapwing Audio are new Belgian plug-in developers. CenterOne is a ‘spatial’ plug-in that doesn’t use M-S techniques at all, relying instead on sophisticated panning and spatial manipulation algorithms. The Pro extension to MasterCheck takes this plug-in to a whole new level, allowing the user to hear (as well as see) how a track will work on different media platforms. Orchestral Tools add orchestral percussion to their Berlin symphonic project and unleash a second cinematic epic. Have QSC struck the perfect balance between sound, portability and price? The System 8 may offer ‘plug-out’ recreations of Roland classics, but it’s also a versatile synthesizer with a character all of its own. Sonic Farm’s latest creation is a processor and amplifier designed to cater for every possible bass guitar recording scenario. The latest vintage-styled plug-in from Sonimus is a neat compressor with a vari-mu flavour. This combination of Pultec-inspired stereo mastering EQ and VCA bus compressor could earn its keep in a wide range of situations. It’s been a long time coming, but the new version of Superior Drummer raises the bar for virtual drum instruments. DJ Shadow’s Endtroducing wasn’t just a staggering technical achievement. It also reimagined a whole musical genre. With only the most basic of keyboard skills, you can use Cubase to play convincing piano parts in real time. We show you how to integrate NI's Maschine with Reason. A list of all articles that hold associated media files for October 2017 audio and video examples. You'll find links in the righthand sidebar of each article. One of the highlights of the 2017 Manchester International Festival was a series of intimate live performances by New Order, who reinvented their stage show by introducing an entirely new set list and a 12-piece synthesizer orchestra! In theory, old Pro Tools sessions should open in version 12. In practice, you may need to know a few tricks! Logic Pro 10.3.2 improves the DAW’s Drummer feature by adding new Percussionists to the mix. Reaper’s Region Playlists make it easy to sketch out new song structures or rework existing tracks. We find out whether a unique choir and a unique church will prove a match made in heaven. Customise your guitar tone with Sonar’s TH3 Cakewalk Edition amp simulator. Thanks to ARA, Studio One users have direct access to Melodyne’s amazing tempo-manipulation tools. We show you how Live and Reason can play together thanks to Ableton Link. Brush up on your listening skills as we review some hit tracks from a producer’s perspective. This month: Niall Horan • London Grammar • Anderson Paak • Classic Mix: Linkin Park ‘In The End’ (2000). A move to the country led the National to rethink their recording process and embrace studio experimentation as never before. Read more about What Price Value? New York’s Avatar Studios — au revoir, but not goodbye. Media content for the October 2017 issue.